In 2016, PRI and global law firm Linklaters collaborated on a study examining how women who have killed their abusers following prolonged domestic abuse are treated in law and before the courts in nine jurisdictions. 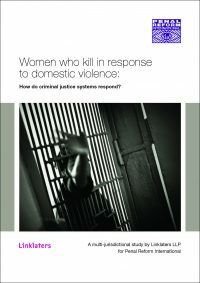 This collaboration culminated in the report Women who kill in response to domestic violence: How do criminal justice systems respond?, which was launched at the UN Commission on Crime Prevention and Criminal Justice in Vienna in May 2017, and which was well-received by international stakeholders. The report was researched by Linklaters’ pro bono lawyers and compiled by Linklaters and PRI staff. Linklaters kindly financed the type-setting and printing costs. After the success of the report, Linklaters and PRI are now expanding their research into other aspects of sentencing of women, capturing challenges and good practice in applying gender-sensitive sentencing, as required by Rule 61 of the UN Bangkok Rules, for women convicted of drug-related offences. These research reports with Linklaters are invaluable resources for PRI that feed into advocacy and programme work and help us push for prison reform on a global level. PRI also hosted the UK launch of Global Prison Trends 2018 at Linklaters’ London office in June 2018. The event consisted of an expert panel discussion, offering insights into the most urgent and emerging issues facing criminal justice systems worldwide, and a networking reception. Interested in becoming a corporate partner? Please contact us at info@penalreform.org or by phone at +44 (0) 207 923 0946.